Quinta do Monte Xisto 2012 Cume here! The Symington family has launched a wine from 1882 to celebrate the arrival in Portugal of the family’s pioneer. The name couldn’t have been more exemplar. Ne Oublie – meaning unforgettable or do not forget! 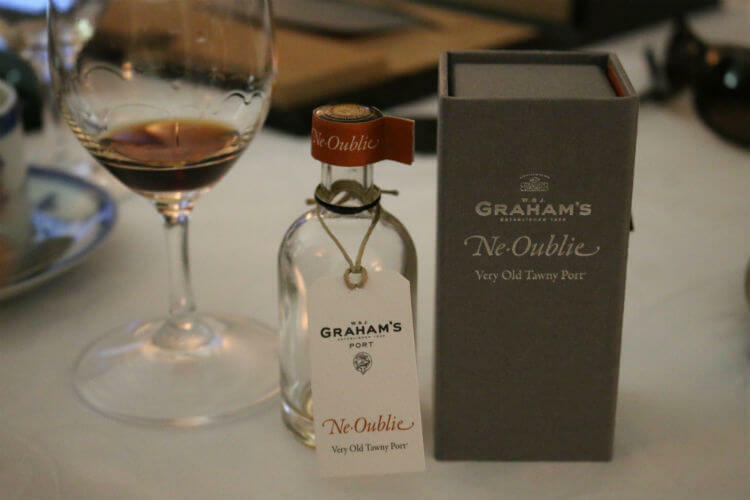 Ne Oublie is more than an extraordinary wine; it is a family jewel, a historical and cultural relic. Ne Oublie – © Blend All About Wine, Lda. These expressions in French originated many centuries ago. We have Honi soit qui mal y pense as an example, a French phrase meaning Shame on him who thinks this evil, much used in educated circles. It is also the motto of the Order of the Garter, the British Order of Chivalry, created by King Edward III, in the days of the Crusades. Legend has it that in 1347, during a ball, the Salisbury Countess, mistress of Edward III, dropped her blue garter. The king promptly placed it back, under the (complicit) gazes and smiles of the court nobles and shouted (in French, the British court’s official language) “Messieurs, honni soit qui mal y pense! Ceux qui rient en ce moment seront un jour très honorés d’en porter une semblable, car ce ruban sera mis en tel honneur que les railleurs eux-mêmes le rechercheront avec empressement.” The following day he created the Order of the Garter – having as symbol the blue garter on a golden background – to this day the most prestigious order in the United Kingdom, with just 25 members and the British monarch as the sole Grand Master. I couldn’t have tasted this wine in better company… so British! Even the weather was appropriate! In Portuguese soil, at Quinta do Bomfim (Bomfim Estate), Pinhão, Douro, under a huge thunderstorm and with two Brits. Paul Symington current director of the Symington Family Estates and Sarah Ahmed, the British writer currently most focused on Portuguese wines. I thank both for this experience! Many consider the price prohibitive – around € 5.500,00. However according to Paul Symington we are talking of not just a drink, but a luxury item, rare and exclusive. 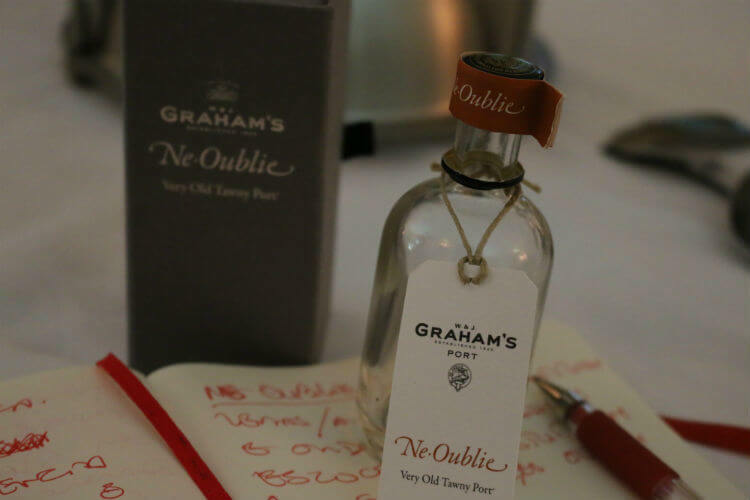 “… If Port wine isn’t able to have a product at the level of Hermès, Cartier or Louis Vuitton, this means we are at a second level…”! And we are certainly talking about a superior level product. An end of the XIX century Port, presented in a numbered crystal-blown decanter, handmade by master glassmakers of the Portuguese Atlantis factory, with three silver rings molded and engraved by Scottish goldsmiths Hayward & Stott and kept in a specially designed leather box, hand produced by the famous British brand Smythson, of Bond Street. Symington is nowadays the main Port wine family. Sales leads in the special categories, they hold the Graham’s, Warre’s, Dow’s, Cockburn’s, Smith Woodhouse, Quinta do Vesúvio, Martinez, Gould Campbell and Quarles Harris brands and possess more than 1000 hectares of vineyards in Douro. The empire and emotional connections the family has with Douro, really began in 1882 when Scots Andrew James Symington, then 19 years old, arrived in Portugal to work at Graham’s, another Scottish family, long established in this country and that, at the time, was dedicated to cotton mills. This is a wine enclosed in just three barrels, one of which originated the 656 bottles now on the market. As a wine, it fits the purest Douro tradition, the Tawny tradition, as the “generous” wine it is, kept in barrels and passing from generation to generation. It is along the lines of Scion, the 155 years old wine Taylor’s launched in 2010, at € 2.500,00 per bottle. 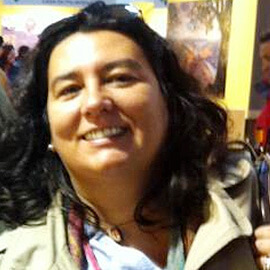 Despite its high cost, the wine was a success and created a copycat effect in the sector. In a short period of time, several very old Port wines appeared on the market, at never before seen prices. The last one to be launched was Taylor’s Single Harvest 1963, one of the wines this company inherited with last year’s purchase of Wiese & Krohn, a small family house specialized in Port Colheitas. 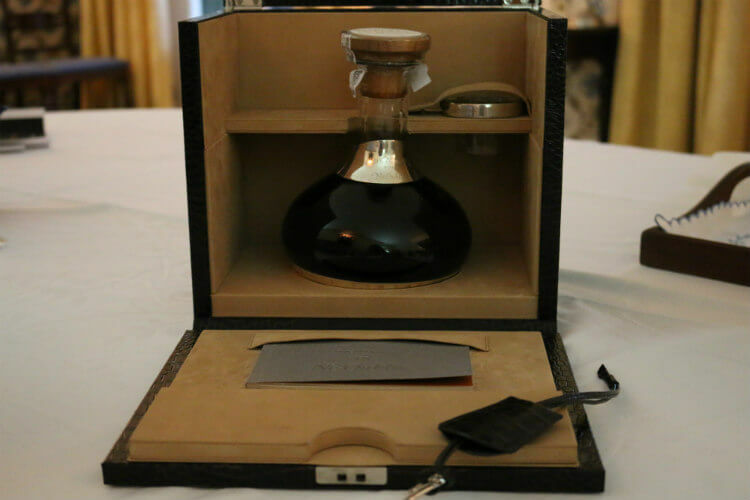 Also enveloped in a luxury case, each one of the 1650 bottles was available for sale at three thousand euros. With Ne Oublie, Symington set the bar even higher. But taking a closer look, €5500 is – more or less – the price of a Porto Vintage Noval Nacional 1963 bottle (no luxury case included). And there are much younger French wines, Champagne, Bordeaux and Burgundy – not as good – and equally expensive. Ne Oublie is then far from being an eccentricity. It is wines like these, exclusive and luxuriously presented, that elevate Port Wine to the highest standard. Deep and hermetically concentrated, it showed precision like no other. 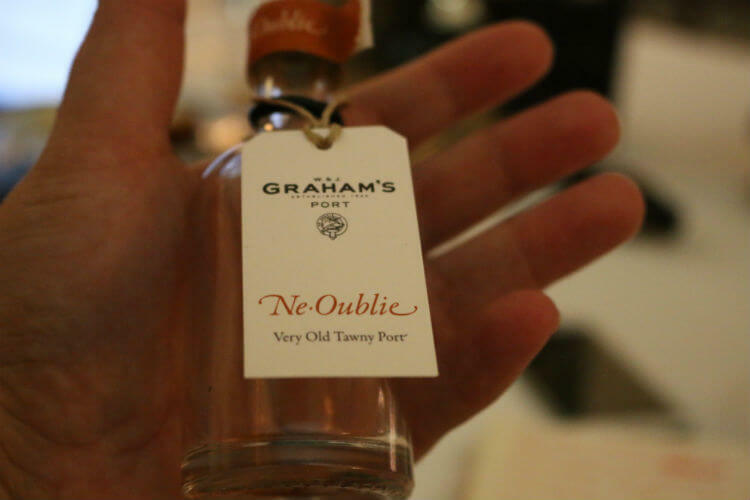 I have tasted other old Ports, but none has impressed me like this one. All good, no doubt, but some reveal too much concentration, excessive molasses, a few exacerbated characteristics or perhaps too much stuff. This one shows everything in its place. To say that you can feel the dry fruit, such as nuts and hazelnuts, is a cliché… of course they are all there! Orange zest, some notes of old wood, a little honey and caramel. Everything exists in this complex wine. Besides that we have iodine and pharmacy notes. The mouth is remarkably overwhelming. Damn… so much finesse… never before tasted. Al dente acidity, well measured concentration, depth and complexity… in the right measure. This wine’s prime characteristic is the precision. The most “accurate” Tawny ever tasted… maybe even one of the greatest examples of the excellence of Douro!